Protective custody is a type of imprisonment (or care) to protect a person from harm, either from outside sources or other prisoners. Many administrators believe the level of violence, or the underlying threat of violence within prisons, is a chief factor causing the need for PC units. This factor was cited by Anderson (1980) and Vantour (1979), with the following broad elements noted as contributing to the problem. Prisoners have the opportunity to request protective custody if they get the impression that the environment they are living in is harmful to their well being. Their request may be granted if the officials rule that the prisoner is truly at risk. Protective custody might simply involve putting the person in a secure prison (if the threat is from the outside), but usually protective custody involves some degree of solitary confinement. For people who are threatened because of their association with a certain group or gang, moving them to another section of the prison may be sufficient. Early uses of protective custody started in the 1960s by law enforcement but it was used infrequently. Federal prosecution of organized crime figures led to the offering of witness protection to key government informers. In 1964 Joseph Valachi became the first La Cosa Nostra member to publicly testify to the existence of the organized crime group, appearing before a congressional committee. Valachi, who was facing the death penalty, agreed to testify in return for personal protection. He was held in solitary confinement for protection and given $15 a month. Since the 1970s the Federal Witness Security Program has grown in size. The program used to fight organized crime, terrorism, gang-related crime, and narcotics trafficking. In 1995, 141 new participants added to the program, increasing the number to 6,580 witnesses and 14,845 total participants since the program began. Also in 1995, 257 protected witnesses testified at trials against organized crime members, resulting in a substantial number of convictions. In return for assistance from these participants, the witness and family members over eighteen years of age must each sign a memorandum of agreement. The witness must agree to testify and provide information to law enforcement officials. In addition, the person must agree not to commit any crime and to take all necessary steps to avoid detection. Most witnesses remain in the program for two years before pursuing their new lives on their own. Unfortunately these programs were abused by some drug dealers. Some dealers have been allowed to keep their narcotics-generated money and have avoided prison in return for testifying against others involved in drug trafficking. Witness protection programs also exist in prisons. To protect witnesses serving a prison sentence, the federal government has created witness protection units within federal prisons. Protected witnesses live a more comfortable life than other prisoners, which includes having free and unlimited access to telephone and cable television and the ability to use their own money to buy food, appliances, jewelry, and other items. Those who are at high risk of being harmed or killed by other prisoners either for their crime or their group (ethnic or otherwise), such as pedophiles, child murderers / child abusers, rapists, men who commit violence against women, people who have committed hate crimes, people who have committed crimes against the elderly, animals, the disabled, the poor and the less fortunate, corrupt police officers, informants, gang members in a prison containing rival gang members or those who choose to "debrief" (provide information on their gang), or prisoners who are gay, transsexual, or transgender. Offenders with notorious criminal activities on the outside who may not be prison-wise or who may be subject to pressure because of their notoriety. Those criminals who are themselves witnesses to a crime, and might be harmed by other prisoners to either prevent them from speaking out, or for revenge. Inmates nearing expiration of their sentences who are trying to avoid disciplinary infractions or other problems. Corrupt public servants, including police officers, civil servants, people convicted of spying, doctors, council officers, etc. Celebrities convicted of serious offences. Space for family and attorney visits must be provided for PC cases, either in the PC unit or in the general population visiting room. An inmate search area and separate inmate entry route should be incorporated into the unit design to ensure the safety of other inmates and visitors. Libraries should be provided for inmates to read, study, and research any of their interest. Protective custody does not necessarily imply a prisoner or a prison setting. In some usages, it might simply involve placing a person in a secure setting, with no implication of imprisonment, such as when a child is placed in temporary foster care. In some cases, non-criminals (or defendants in pending trials) have also been placed in protective custody in a prison setting, for example to protect them from being lynched. In Nazi Germany, the German equivalent term, 'Schutzhaft', was used as a euphemism for the extra- or para-legal rounding-up of political opponents and especially Jews, sometimes officially defended as being necessary to protect them from the 'righteous' wrath of the German population. Schutzhaft did not provide for a judicial warrant, in fact the detainee would most probably never have seen a judge. 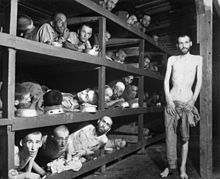 The victims were then sent to concentration camps such as Dachau concentration camp or Buchenwald concentration camp. ^ Henderson, Phillips, James D., Richard L. (1991). Protective Custody Management in Adult Correctional Facilities. The National Institute of Corrections. ISBN 0-929310-40-3. ^ Turner, Julia. "How Protective is Protective Custody?". Retrieved 4 March 2011. ^ "Tattoo in prison makes molester a marked man". IndyStar.com. 2006.